The above program was offered on February 3, 2007 at The University of Michigan School of Music. At that time, Louis Nagel was Director of Outreach and I was Chair of the Ann Arbor Committee of the Michigan Psychoanalytic Institute. The contents of the program, which was interdisciplinary and co-sponsored, are as relevant today as they were 12 years ago. What other occupation begins to train people at four years old or younger? In what other occupation do people spend thousands of dollars on years of private lessons, perform in public at an early age, and deepen their study as adolescents and adults to pursue a career that offers fewer jobs than the number of people trained to hold them? Who would train for an occupation knowing that one’s work opportunities would be so limited, one’s career path so fraught with rejections, low pay, and intense competition? Who places the value of “psychic income” (e.g., the love of making music and getting audience approval) above (or equal) earning “real” dollars? It is in these areas that performing musicians, particularly those intent upon a traditional performance career, differ from people with advanced training in a field who do not need to begin their formal education, much less make a career choice, at young ages. Musical performers begin instrument lessons when very young. My research (Nagel 1987) showed results similar to those of Fishbein, et al. (1987): 90 percent of musical performers begin music lessons before the age of twelve. Nearly half, 46 percent, begin before age seven. In Suzuki musical training, many children begin playing an instrument before age four. These data raise obvious questions regarding a child’s psychological, interpersonal, physical, and social development during these years of musical training. One’s formative years physically and emotionally develop along with one’s musical talent. This has enormous implications for personality and musical development over the life cycle. It is not possible to achieve the extraordinary technical proficiency, musical knowledge, and dexterity required to play a musical instrument at a high level if one begins training at a later age when most people choose their life’s work. Career opportunities for individuals who seriously pursue a professional career in the performing arts are extraordinarily difficult both to establish and sustain. Budget cuts to arts organizations often threaten the livelihood of those fortunate enough to have found employment. Many musicians facing unemployment and underemployment hold “day jobs” despite data from the National Endowment for the Arts that show them to be as qualified as their higher-earning peers. One of my music patients told me that her parents were nervous about her career choice and were “afraid she would wind up eating dog food in New York!” The realities of music-as-profession present a range of practical, interpersonal, and psychological challenges. I have experienced first hand the joys, trials, and travails of being a musician and trying to earn a living from it. I have experienced stage fright from my early years. I love music; I am passionate about music. It is part of who I am and what I value at my deepest emotional levels. I combine music and affect (particularly the anxiety and depression associated with performance anxiety) in my thinking, my clinical work, and my writing. However, I have navigated far from the career I envisioned. I felt insulted since I interpreted his comment to mean I could not make it in music so I should have back-up choices. How right he was about options and how incorrect was my doubtful interpretation. It was by keeping my options (unknown to me at the time) open that I have been able to find great pleasure in what I do that combines my work in music and my interest in understanding and helping people psychologically. My music training enabled me to think analytically, listen carefully, look beneath the surface of any melody (or thought/feeling), and work intensively and creatively to sustain a career as a hybrid. As you will note in the photo/flyer that introduces this article, I have been offering programs on stage fright for many years. I accidentally came across this particular flyer several days ago when I was clearing out some old papers. The title and the event made me pause and reflect. Although this program is dated 2007, I had been giving presentations on stage fright years before that. If I recall correctly, my first presentation on the topic was at a conference in London in 1981. This presentation was before the issue of performance anxiety began to crop up regularly on music conference programs and has gradually become a staple topic at them. Many teachers have joined the anxiety and wellness bandwagon. Yet, some schools have been slow to institute comprehensive courses and intensive programs on the psychology of performing and careers (Nagel, 2009, 2017). In fact, my 1987 Dissertation in psychology was about career choice (and career alienation) in music. How forward thinking. How long ago. How currently relevant. I feel honored to have been invited to offer my work with teachers and students at various events. It has been rewarding to share the stage with professionals in panels, discussions, and in joint master classes with my husband, Louis, where we work both musically and psychologically with students. Much more needs to be done to help musicians realize that, indeed, they have options. What I particularly want to emphasize is the multi-faceted and early emphasis of the 2007 program which maintains that performance, stage fright, careers, self-esteem, and self-promotion are related and need to be addressed through an interdisciplinary lens. This lens includes experts both in-house and external to organizations and schools. Only when we see the musician as a whole complex person who is pursuing a difficult and gratifying profession do we realize that the musician exists in a larger context of psychological, economic, social, and physical challenges (including rejections and competitions) as well as opportunities regarding career choice in music. I urge you to emphasize this idea as I encourage the promotion of health in making music and in making healthy musicians. Fishbein, M., & Middlestadt, S. E. (1987). The ICSOM medical questionnaire. Senza Sordino, 25, 1–8. Nagel, J.J. (1987). An examination of commitment to careers in music: Implications for alienation from vocational choice. Dissertation, University of Michigan. Nagel, J. J. (2009). How to destroy creativity in music students: The need for emotional and psychological support services in music schools. Medical Problems of Performing Artists, 24(1), 15–17. 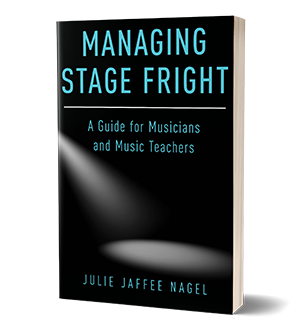 Nagel, J.J. (2017) Managing Stage Fright: A Guide for Musicians and Music Teachers. Oxford University Press.